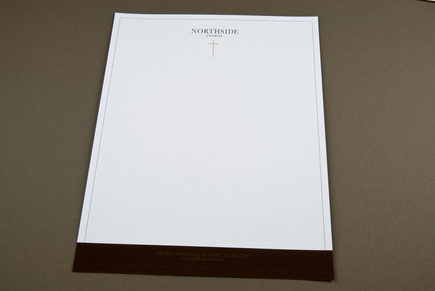 This letterhead is appropriate for a community church striving to enrich the lives of its members. The humble, unobtrusive aesthetic creates an image of an inviting church where all are welcome. The strong brown rectangle situated at the bottom of the page gives the letterhead a grounded feeling, which relates strongly to the mission statement of many churches.